This 77-slide PowerPoint presentation fully illustrates a comprehensive process for the formation of a Strategic Business Plan. It is intended to provide a compendium of substantive input based upon consulting market and management coaching experience and proven techniques generated from currently respected approaches. It is inclusive of both accepted new, as well as long-standing classic systems if considered compulsory today to the formation of an effective, successful strategic plan. There are several popular but currently less effective tools (eg BCG Matrix, etc.) that have not been included in this guide. We will only utilize those tools and processes that have, through our experience, proven effective for Strategic Planning formation in today's Digital Economy (please see author background below). This unified guide is meant for executives and business owners who are responsible for creating, demonstrating the logic for, and leading the strategic planning exercise within their respective organizations. Our purpose in this presentation is to define what is meant by strategy. It includes a historical perspective to clarify why a Strategic Management and Formulated Strategic Plan is critical to business success. We will discuss the creation, facilitation, and implementation of a strategic plan through an essential, unified process relevant to the objectives sought by the business and organization utilizing it. 3. 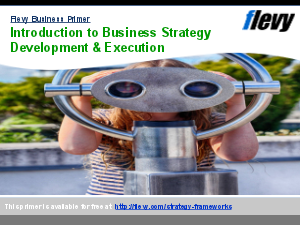 To describe strategic formulating and developing of a business plan. For more information on Strategic Plan formation, take a look at my supplemental document available on Flevy, Critical Baselines for Effective Strategic Planning. Strategic Planning? Strategic Analysis? Supply Chain Analysis? Or something else.